The Valdera offers its visitors not only a rich heritage of art, history and traditions, but also the possibility of making the acquaintance of unique medieval villages of Etruscan origin, where man and nature meet in harmony. During a walk along the Wine Road of the Pisan hills you will encounter the charming and romantic villages Palaia, Peccioli, Lajatico, Terricciola, Chianni and Capannoli. As in a trip by the time machine you can enjoy the life here of yesteryear. Since the Middle Ages, the area seems to have fallen asleep like Sleeping Beauty. A visit to these places is in every season an experience. Here, everything is characterised by first-class wines. You can visit vineyards and wineries, enjoying traditional dishes and participate in the many cultural events and wine festivals. The fun-loving and hospitable peasantry has preserved the nature and traditions as a sanctuary. They know the co-existence between man and nature. Visitor experience here, which in everyday life and in the rush seems to disappear: not the material goods are important, but the respectful life in harmony with the nature. 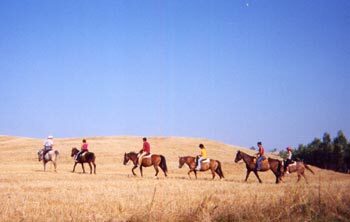 For the recovery of this lost values we offer you for your vacation in this most beautiful region a wide range of outdoor activities like golf, hiking and trekking tours, excursions on horsebackor by bicycle. Accommodations are available for you in dreamy farms . You have the choice between comfortable guest rooms or apartments.